Doesn’t this picture look cosy. Even better still imagine it is a room which only seats 8 people max and has an electric fireplace at one end. 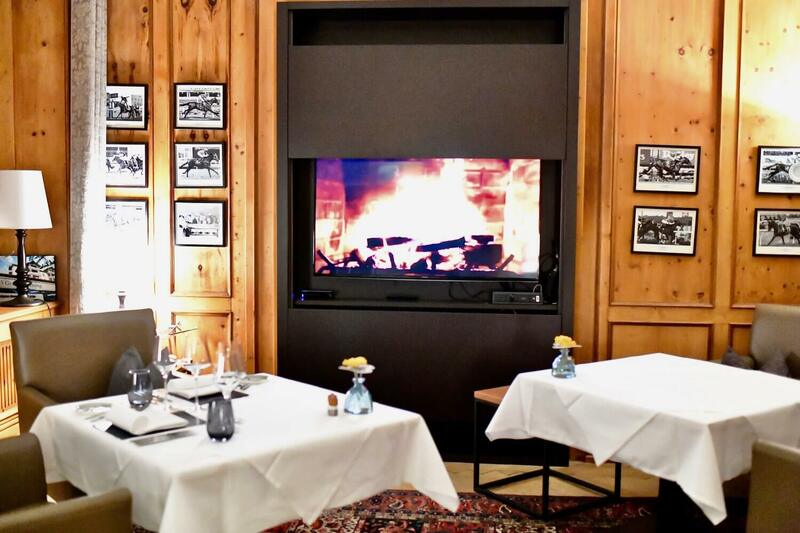 Doesn’t get much more cosy or romantic than that does it – smile! For me it felt like a bit of a home coming. 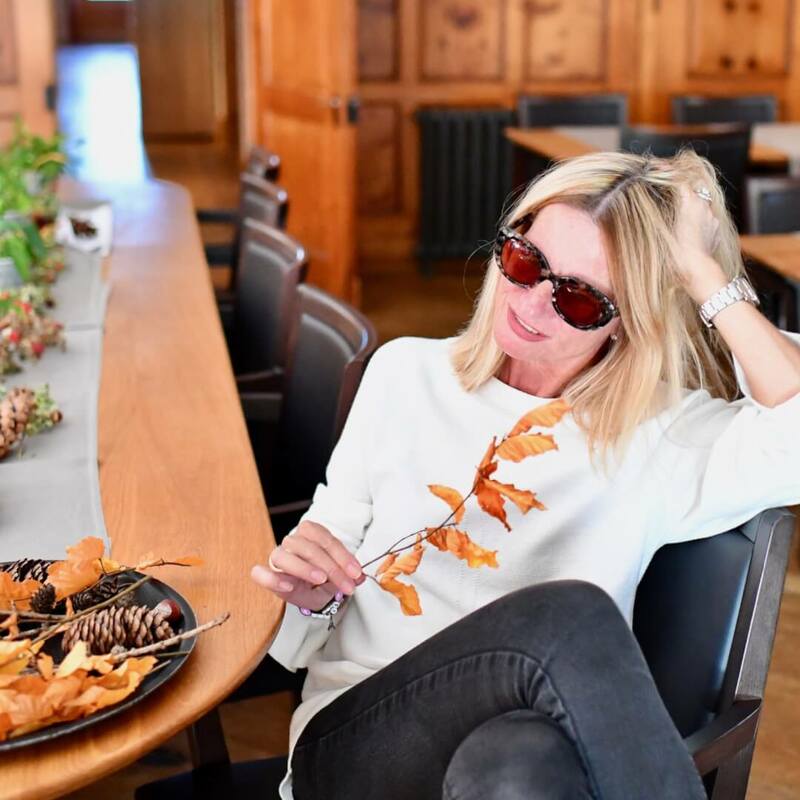 I’ve visited The Alpina Mountain Resort & Spa in Tschiertschen before (read full article here), this visit I came especially to try out their new local gourmet menu in the exclusive Tropaios lounge. It’s school holidays here in Zurich so I went with my daughter Cassia. Such a special evening and experience where it was just the 2 of us bonding once again… anyone with teenage children knows how important this is from time to time! However the romantic atmosphere and lovely experience makes me want to repeat – this time with my hubby – smile! 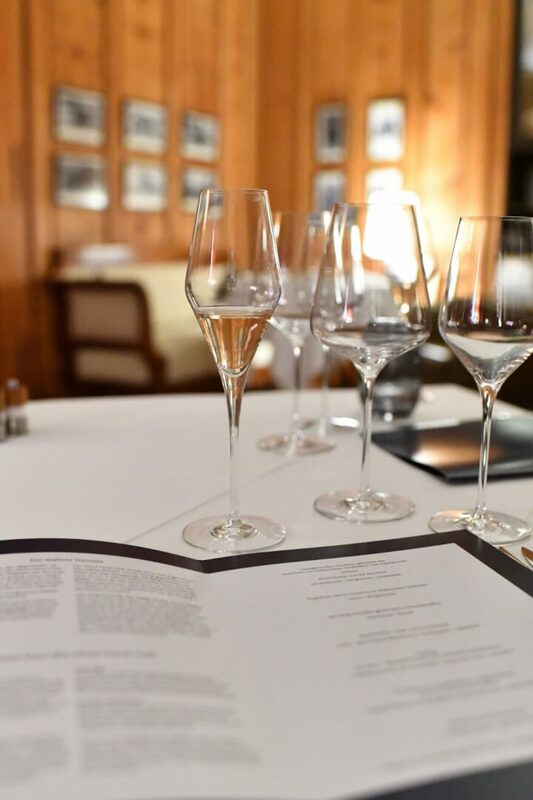 You’ll agree with me soon I know – but for now I want to tell you if you’re looking for a special celebration treat this is the place to go to! The hotel has 2 dining rooms. The special gourmet menu we tried, is served in the romantic Tropaios lounge which seats a max of 8 people at any one time. Starting with a glass of local sparkling… whilst reading the story of how the Tropaios lounge came to be. 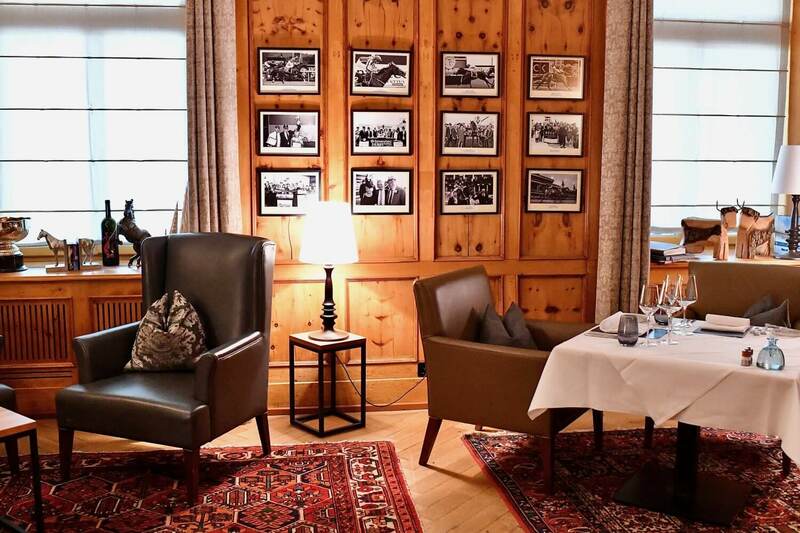 The lounge is named after a favourite race horse belonging to the hotel owner. He started his passion for horse racing with zero knowledge of the sport. Setting up the China Horse Club in 2013 and managing to win over 400 horse races with his horses in 13 different countries in under 5 years. What an amazing story! 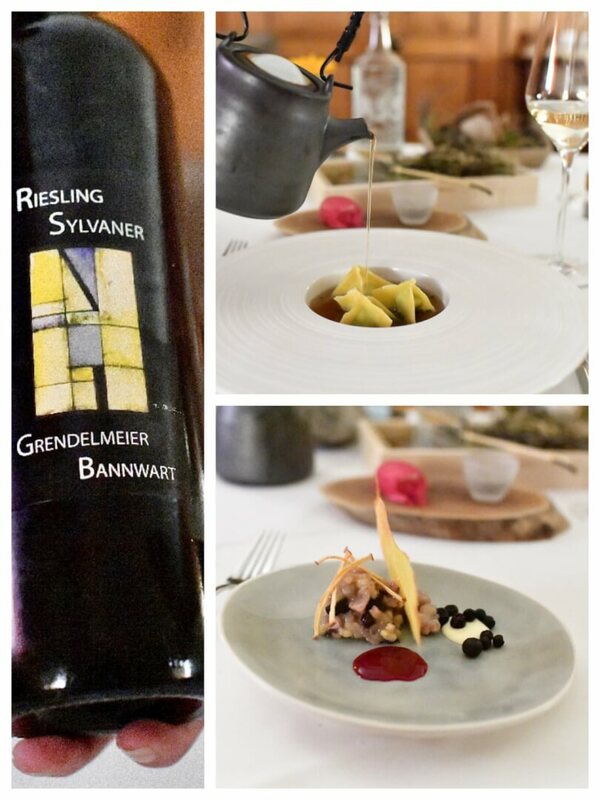 Each course was made out of ingredients totally from Graubünden. 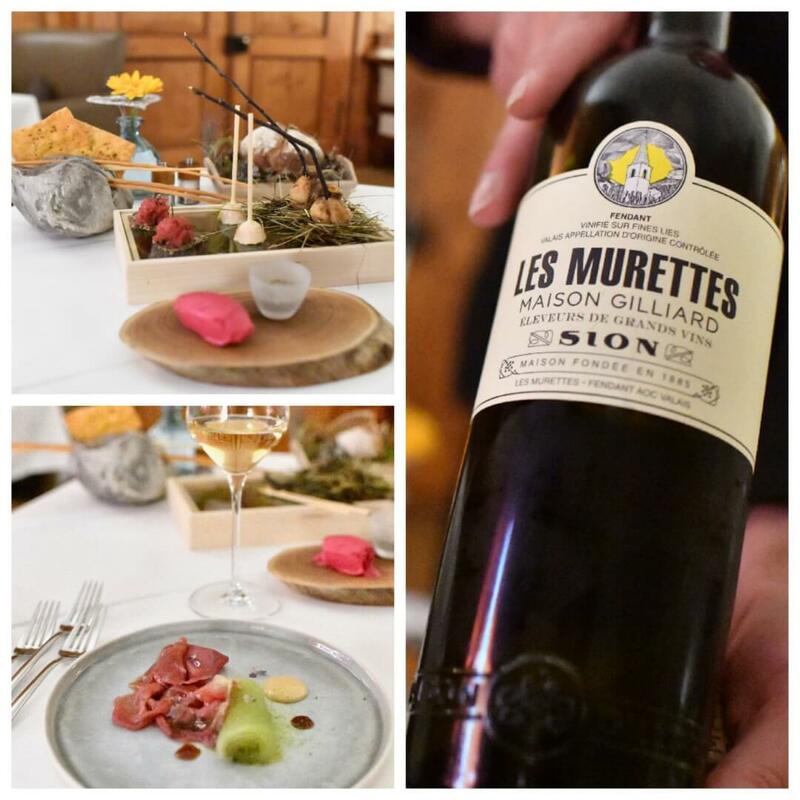 Appetiser and first course were served with a Swiss Fendant wine. Top left: homemade hemp bread, grossing, beetroot butter wit mountain herbs and salt. Bottom left: Woodruff marinated lamb carpaccio with cucumber marinated in thyme. Followed by Smoked chicken bouillon with nestle ravioli (top right), and then a wonderful trout tartar with apple and blueberries. 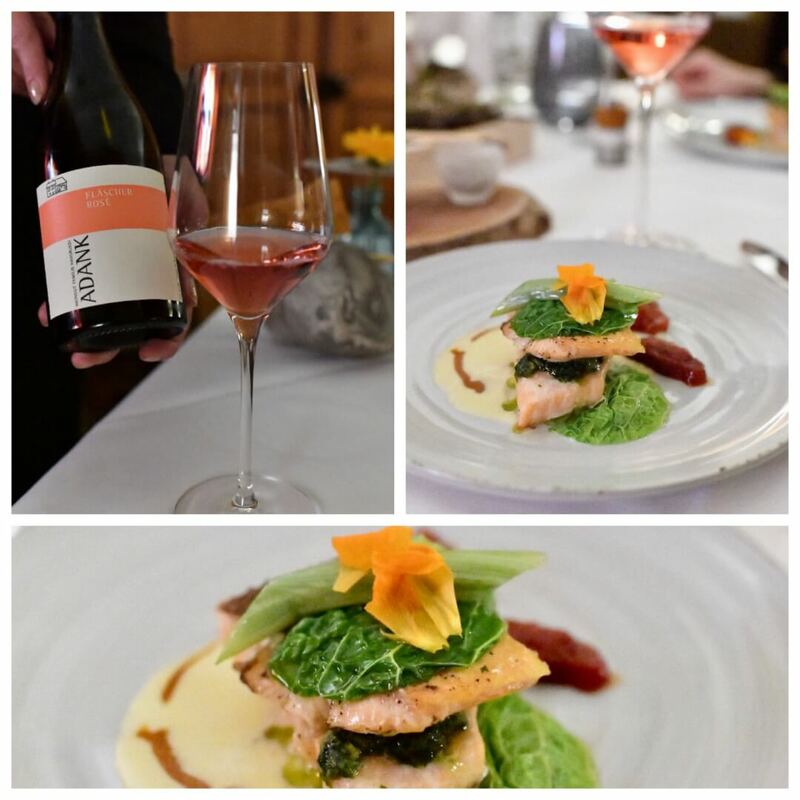 First mail course – Char fish from Lumnezia, served with a local rose wine. Second main course – fillet of local Tschiertschen long horn cows cooked two ways – slow and fast. 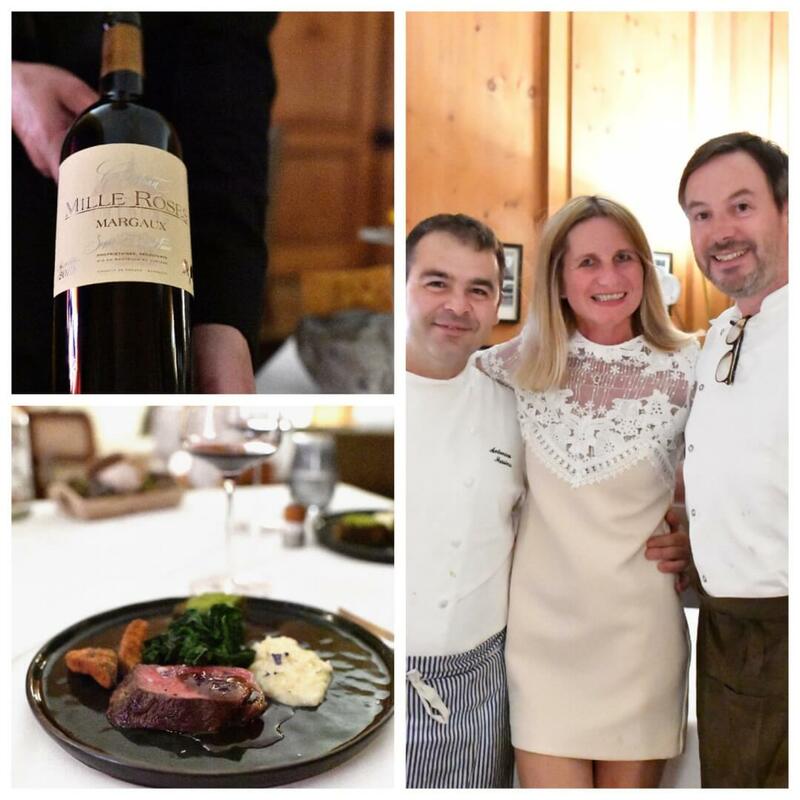 Plus meeting our chefs – Antonio Messina and Lukas Pfaff. 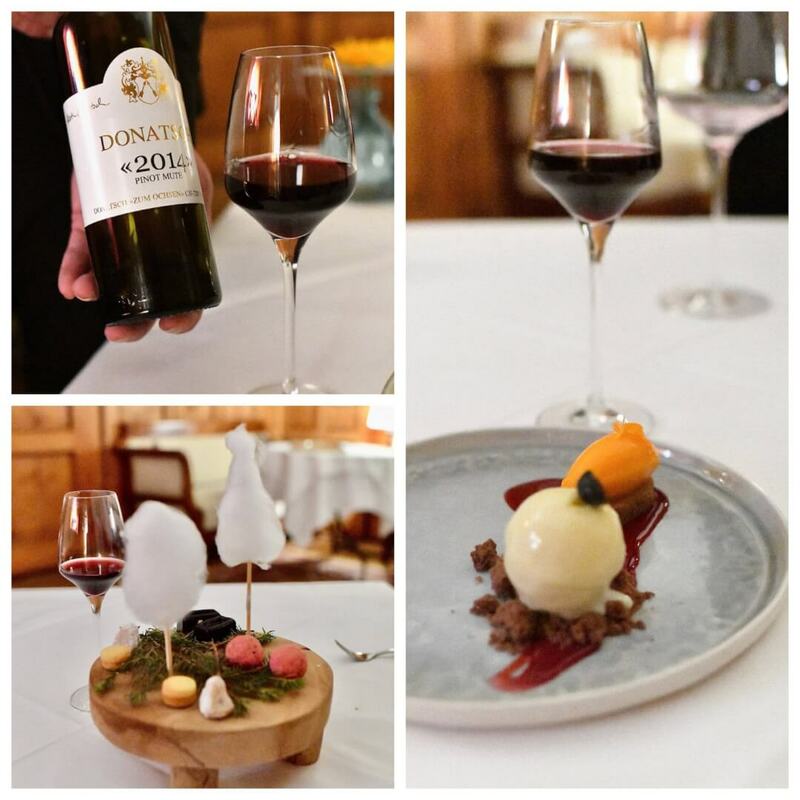 Finishing the evening with the most amazing selection of deserts accompanied by a sweet red wine – absolutely delicious! 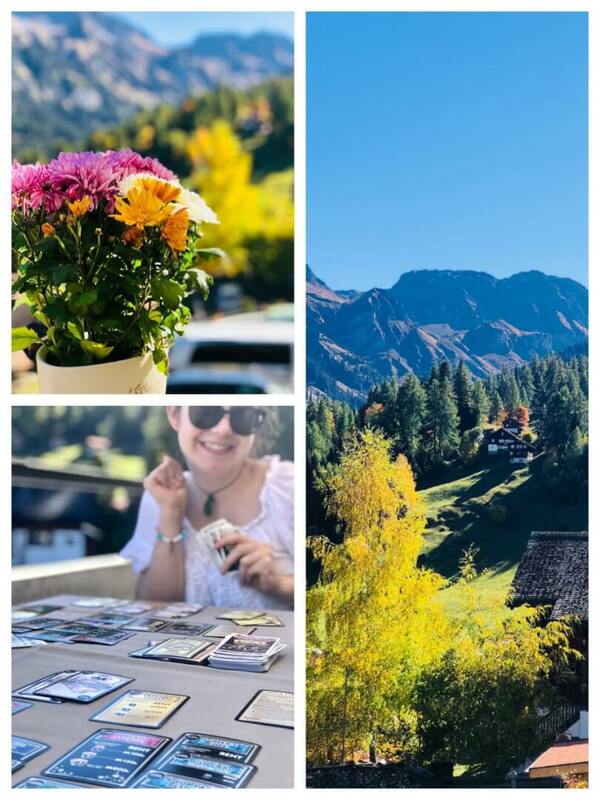 Haha – it’s true we started our afternoon sitting on the sunny terrace playing a card game together. Going back to the roots and being kids again. Followed by a walk around the village. Discovering the vintage bus from 1954 – you can buy tickets for this at the hotel. then walking up the little hill in the middle of the village where the sun sets last. Such a friendly spot where we also got to chat with other locals doing the same afternoon stroll. View from our room the next morning. 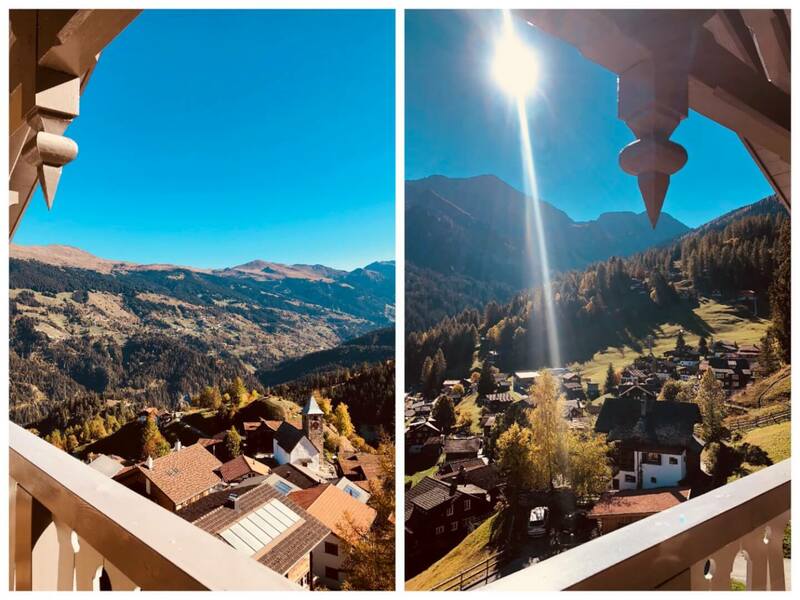 This hotel really has a special place in my heart, I can see why the “Sonntagszeitung.ch” nominated it to be within the top 20 Nice Price hotels within Switzerland. I can only recommend from the bottom of my heart that you try this out too! The perfect place to recuperate from busy city life and bring a bit of zest back into life! Open your heart with food and travel! 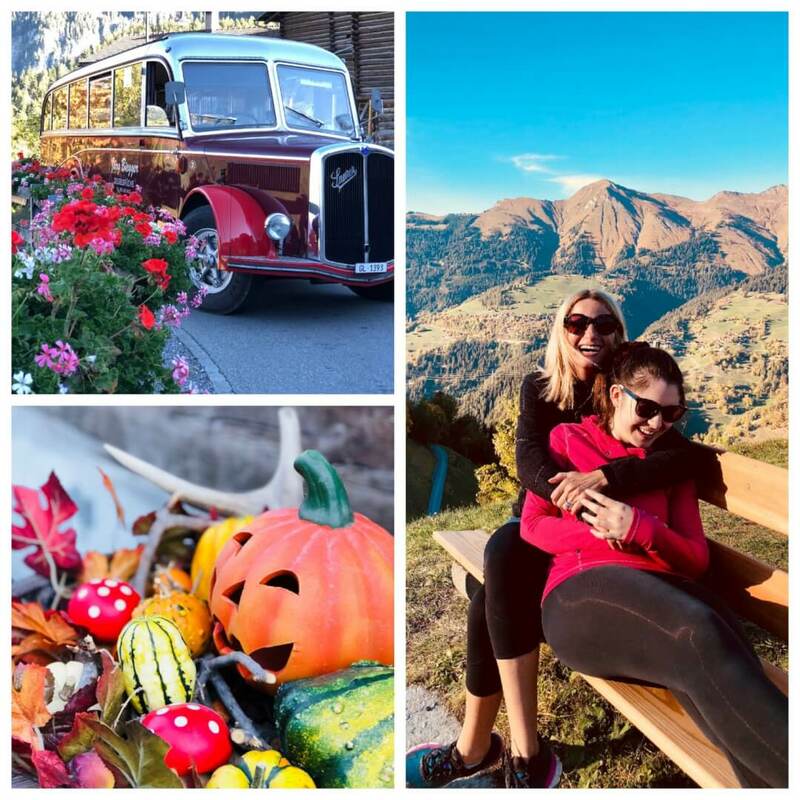 This post was written in collaboration with The Alpina Mountain Resort & Spa. All opinions are my own. « YouMo: The e-bike which really has all the features!